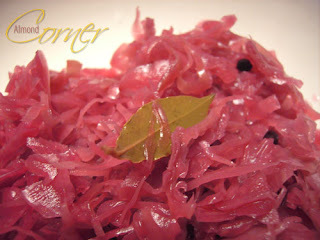 The best to prepare this pickled cabbage out of young cabbage. I recommened to use a mixture of white and red cabbages. It is better to use a bigger white and a small red cabbage. Actually you can eat it after 3 weeks, however it might take longer if the cabbage is old. This time I had to wait almost 3 months, but now it is really yummy! Grate cabbages with a help of a mandoline. Salt and mix well, put aside for 40 minutes. Bring 1 1/2 liter water to boil together with pepper, bay leaves, let it cool. Add vinegar. Squeeze cabbage and put in glasses together with pieces of horseradish. Pour water on it and let it stay open for 3 days. After, if needed add more vinegar and close. Hey, this is great! Can I use this process, and add more veggies (shredded) to the cabbage? Maybe you have a recipe for that, like mixed salad, or whatever it's called. I have canned in the fall, for the first time on my own. Used to do it with my mom, when I was younger. This is something I would certainly love to try. Thanks, and I love the color! Yeah sure you can use other veggies! For example you can add shredded carrot, onion, paprika, cucumber and so on. Process is the same, however on top you can add some preserving ingredient, just to be sure. Or after you filled it with the vinager mixture, you can cook up the rest of the liquid with 1/2 teaspoon of preserving ingredient and the next day you can add the new liquid instead of the old. oh! this is interesting! salivating now! I used to buy it, but would love to make it myself. I will, this year. I am gonna make it also that way this year! Thanks for this great inspiration. Mango Ice Cream - Cinco de Mango! Wiener Schnitzel, well not exactly!